State tests for the T-50 are scheduled to be completed in 2016. Separate elements of Russia’s sixth-generation fighter are already being tested on fifth-generation - Sukhoi PAK FA fighters (Prospective Airborne Complex of Frontline Aviation), Vladimir Mikheyev, advisor to the First Deputy Director General of Concern Radio-Electronic Technologies (KRET, a subsidiary of Rostec State Corporation) told TASS in an interview on July 11. Back in early March reports stated that work on the sixth-generation fighter aircraft had begun, with the fighter’s manned and unmanned versions under development. The fighter prototype is expected to perform its maiden flight prior to 2025. That said, KRET is currently working on electronic warfare (EW) systems for the new warplane. Meanwhile, Russia is testing the fifth-generation fighter PAK FA (also known as T-50) that had carried out its maiden flight in 2010. State tests for the T-50 are scheduled to be completed in 2016, and in 2017, followed by mass deliveries of these fighters to the army. "Standalone solutions that will be applied in the sixth-generation fighter are now being tested on the fifth-generation jet as well as on the ground-based equipment. Separate elements of the flight and navigation system have already been installed on PAK FA", Mikheyev said. According to him, the sixth-generation fighters will be fitted with a unified electronic warfare system, which will serve as a radar, an electronic warfare system, a data transmission system and as communications equipment. Additionally, it will function as a navigation system and as an IFF transponder. "The PAK FA radar station should operate both as a locator and reconnaissance system, and the electronic warfare system for its part should engage in radio detection and location. 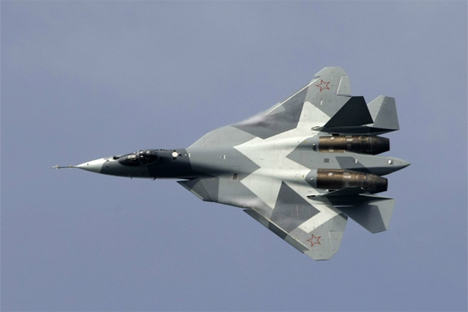 That is, integration and redistribution of functions on the PAK FA is already happening," the KRET representative said. According to him, the use of integrated avionics is tested on many aircraft. As an example, he cited the U.S. fifth-generation fighter, the F-35. The PAK FA aircraft is a stealthy, single-seat, twin-engine jet fighter, and will be the first operational aircraft in Russian service to use stealth technology. It is a multipurpose fighter designed for the air superiority and attack roles. The fighter is planned to have super-cruise, stealth, super-maneuverability and advanced avionics to overcome the prior generation of fighter aircraft as well as ground and maritime defenses. The PAK FA is intended to be the successor to the MiG-29 and Su-27 in the Russian Air Force and serve as the basis for the Fifth Generation Fighter Aircraft being co-developed by Sukhoi and Hindustan Aeronautics Limited (HAL) for the Indian Air Force.